Roderick Ferguson, Professor of African American Studies at the University of Illinois at Chicago, is the author of the widely celebrated Aberrations in Black: Toward a Queer of Color Critique, The Reorder of Things: The University and its Pedagogies of Minority Difference, and the new We Demand: The University and Student Protests. 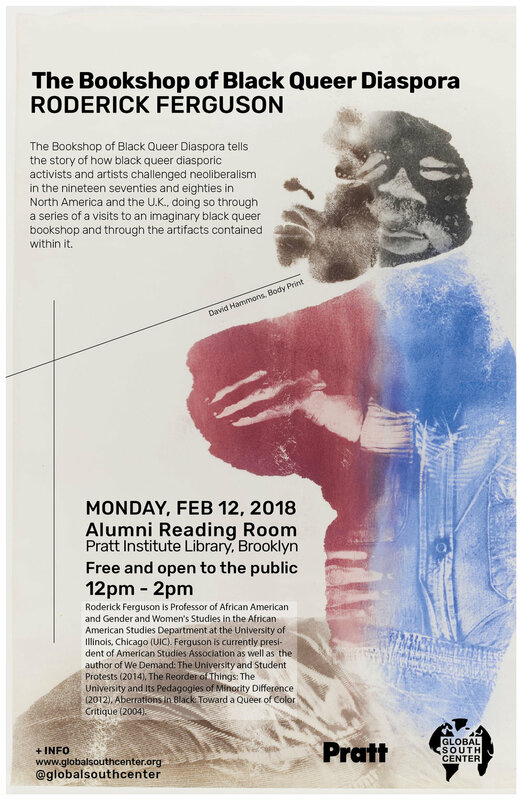 The Bookshop of Black Queer Diaspora tells the story of how black queer diasporic activists and artists challenged neoliberalism in the nineteen seventies and eighties in North America and the U.K. Telling the story through a series of visits to an imaginary black queer bookshop and through the artifacts contained within it. This will be a unique opportunity to engage the new president of American Studies Association, Roderick Ferguson, one of the foremost scholars working at the intersections of Black Studies, Queer Theory, and Critical American Studies today. His visit is co-sponsored by Critical and Visual Studies and the Global South Center.